If you are looking for a relaxed environment then your own static caravan could be just the thing. 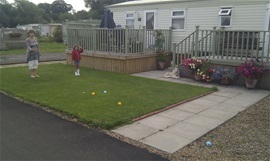 We have a selection of static caravans on the Park and a choice of caravans for sale. The Park is open all year round so you can make good use of your caravan. Please call the Park Office for more information. With a choice of fees available you can decide whether to go "all-inclusive" or "pay and stay". Either way you will enjoy the convenience of using your touring caravan without necessarily having to hitch it to the back of your car. Touring caravans can always be taken off the park, perhaps for a summer holiday break, and a pitch will be available for your return. So, if parking space for a caravan at home is limited, you are concerned that people will know you are away because your caravan is not there, or you want to avoid towing, please contact the Park Office for more information.